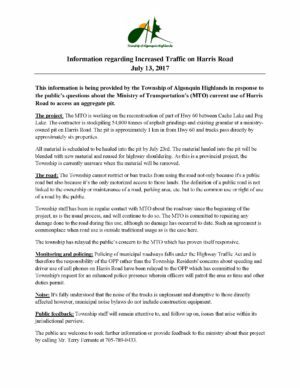 Many may, or may not, be aware of the increased truck traffic on Harris Road. It was counted in 2 hours 60 trucks and then at a second time of 4.5 hours 75 trucks. These trucks take up most of the roadway. The township has been alerted. And the following response made by Angie Bird, chief administrative clerk. While not digested yet by our association, I felt prudent to at least inform you of the response. Please reach out to me with any thoughts you may have on the matter.